In the recent times, paper bags have emerged as a perfect promotional product due to their wide appeal. The main advantages of choosing them are that they are cheap, eco-friendly as they don’t pose any kind of threat to the environment & can be easily recycled. It is an intelligent move to choose paper carry bags as a promotional tool from the environmental point of view too. The popularity of printed paper bag is evident from the fact that every company whether they are selling apparels, books, chocolates, gift items are giving products in customized eye catching paper bags to their customers. Once people notice it, the design and logo will communicate with the reader about the company’s product & service within a blink of an eyelid. S S Graphics offer you attractive eco-friendly printed carrier bags at an affordable price. We adopt the latest printing technology to print supreme quality carry bags at a less cost. We have printed numerous carry bags in attractive colors and designs that have helped our clients to promote their business effectively. 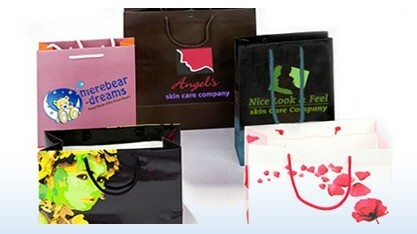 The bags are durable and can be completely customized as per your needs. Remember, here is a win-win situation for you – Having S S Graphics as your print partner you will get supreme quality paper bags at less price, secondly you would be doing your bit to protect the environment. 8" X 5.75" X 4"
Paper Bags Printing is Easy! As the movement against plastic bags and favouring green environment intensifies, paper printed bag becomes one of the best choices for many consumers. Paper bags provide convenience to the customers. One can take the chance and promote your brand with an eye-catching and attractive printed Paper bag. Paper bags serve as unbeatable marketing tools . They contain the company’s name and logo and thus reinforce the brand image of the company as well! Size : Choose an Option... 8" X 5.75" X 4" 12" X 10" X 3" 14" X 10" X 3" 14" X 12" X 3" 17" X 13.5" X 4"